Power BI Desktop lets you build advanced queries, models, and reports that visualize data. With Power BI Desktop, you can build data models, create reports, and share your work by publishing to the Power BI service. Power BI Desktop is a free download. Either approach will get the latest version of Power BI Desktop onto your computer, but there are a few differences worth noting, which are described in the following sections. 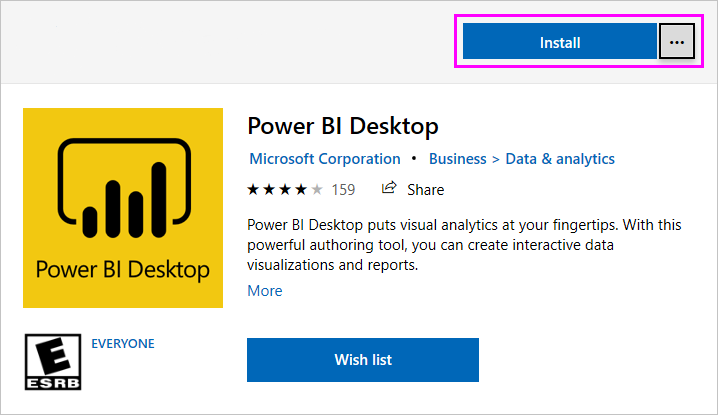 To download the most recent version of Power BI Desktop, you can select the download icon from the upper right corner of the Power BI service, and select Power BI Desktop. Power BI Desktop download (both 32- and 64-bit versions). Installing the downloaded (MSI) version, and the Microsoft Store version of Power BI Desktop on the same computer (sometimes referred to as a side-by-side installation) is not supported. Automatic updates - Windows downloads the latest version automatically in the background as soon as it's available, so your version will always be up to date. Smaller downloads - The Microsoft Store ensures only components that have changed in each update are downloaded to your machine, resulting in smaller downloads for each update. Admin privilege is not required - when you download the MSI directly and install, you must be an administrator for the installation to complete successfully. When you get Power BI Desktop from the Microsoft Store, admin privilege is not required. IT roll-out enabled - the Microsoft Store version can more easily be deployed, or rolled-out, to everyone in your organization, and can make Power BI Desktop available through the Microsoft Store for Business. Language detection - the Microsoft Store version includes all supported languages, and checks which languages is being used on the computer each time it is launched. This also affects the localization of models created in Power BI Desktop; for example, built-in date hierarchies will match the language that Power BI Desktop was using when the .pbix file was created. If you use the SAP connector, you may need to move your SAP driver files to the Windows\System32 folder. Installing Power BI Desktop from the Microsoft Store doesn't copy user settings from the MSI version. You might have to reconnect to your recent datasources and re-enter your data source credentials. 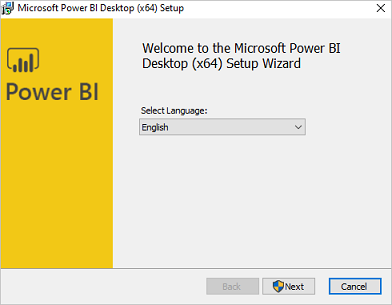 The Power BI Report Server version of Power BI Desktop is a separate and different installation from the versions discussed in this article. 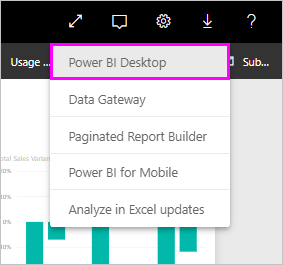 For information about the Report Server version of Power BI Desktop, see Create a Power BI report for Power BI Report Server. When you launch Power BI Desktop, a Welcome screen is displayed. 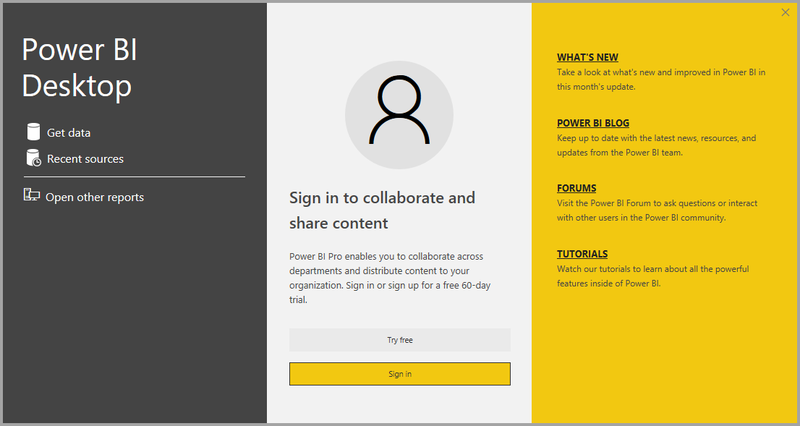 If this is your first time using Power BI Desktop (if the installation is not an upgrade), you'll be prompted to fill out a form and answer a few questions, or sign in to the Power BI service before you'll be able to proceed. From there, you can begin creating data models or reports, then share them with others on the Power BI service. Check out the More information links at the end of this article for links to guides that can help you get started using Power BI Desktop. Memory (RAM): At least 1 GB available, 1.5 GB or more recommended. Display: At least 1440x900 or 1600x900 (16:9) recommended. Lower resolutions such as 1024x768 or 1280x800 are not recommended, as certain controls (such as closing the startup screen) display beyond those resolutions. Windows Display settings: If your display settings are set to change the size of text, apps, and other items to more than 100%, you may not be able to see certain dialogs that must be closed or responded to in order to proceed using Power BI Desktop. If you encounter this issue, check your Display settings by going to Settings > System > Display in Windows, and use the slider to return display settings to 100%. CPU: 1 gigahertz (GHz) or faster x86- or x64-bit processor recommended. We always want your experience with Power BI Desktop to be great. There may be occasions when you run into an issue with Power BI Desktop, so this section contains solutions or suggestions to address issues that might arise. "We weren't able to restore the saved database to the model"
Updating to the current version of Power BI Desktop usually solves this issue. Set the value of that new entry to 1. You'll need to restart your computer for the change to take effect. Press the Start key and type the world blurry into the search bar that appears. In the dialog that appears, select the option: Let Windows fix apps that are blurry. This issue may resolve after subsequent Windows updates are released.